After a busy couple of weeks, I’m back on track with the 2015 Holiday Collection reviews. Today I’d like to introduce you to the stunning Chanel Rose Fusion from the Chanel Vamp Attitude Holiday 2015 collection. 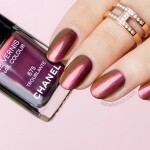 It’s one of two limited edition nail colours Chanel is offering this season. The second is the classic black red creme Chanel 18 Vamp (or Rouge Noir), also very beautiful and a nice addition to any Chanel Le Vernis collection. I went for the colour that appeared to be more interesting and unique – Chanel 757 Rose Fusion. 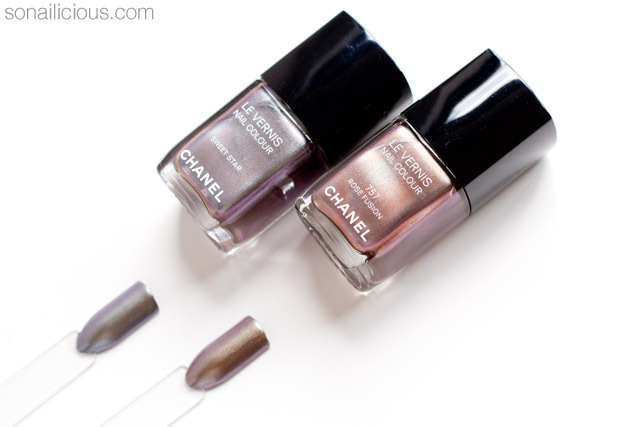 The shimmering dark purple taupe Rose Fusion has the same understated chic vibe that Chanel Sweet Star has. 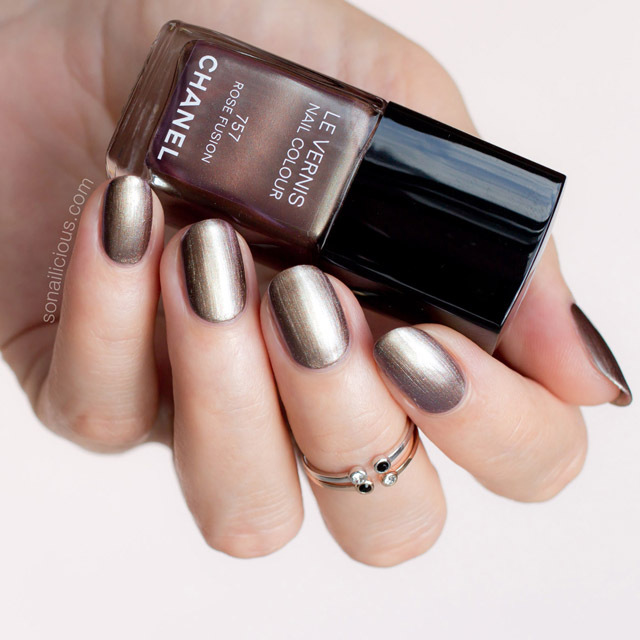 The elegant chameleon effect and understated shimmer effect transforms into a bright shine in direct light. Rose Fusion is a warm colour with bronze and rose-purple particles that look almost brown in some lighting conditions. Sweet Star on the other hand has a grey purple metallic shimmer with green hues and a slight pearlescent effect making it lighter and colder. I was lucky to get Rose Fusion before it sold out. 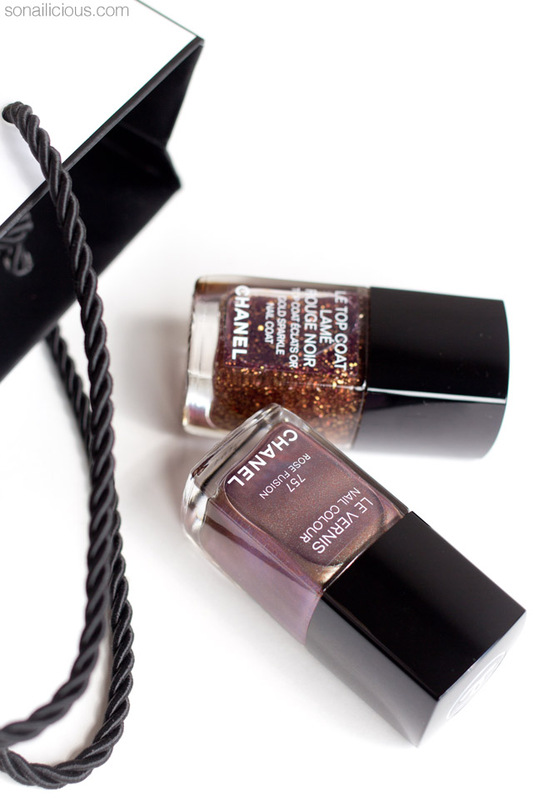 It’s an interesting colour and the strong shimmering effect makes it a perfect evening polish. 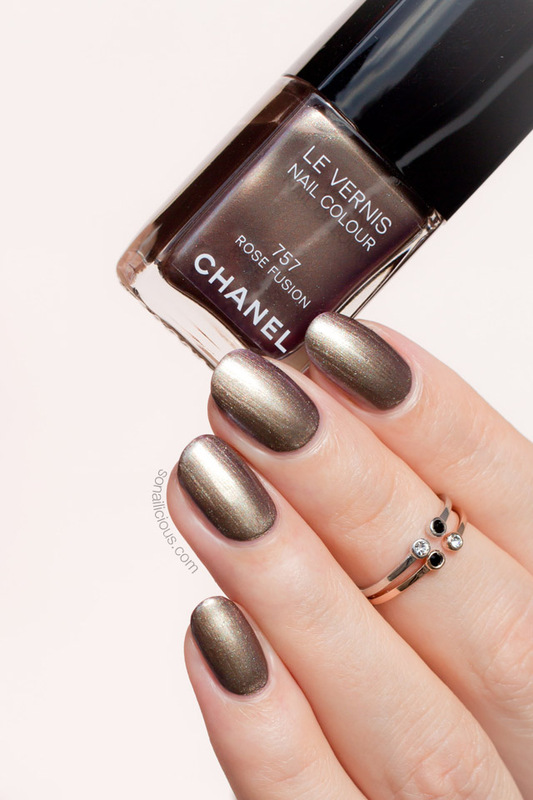 Definitely one of my most treasured polishes along with Chanel Peridot, Sweet Star and Taboo. But did it perform well? Formula: 5-free. Fast drying and highly pigmented. 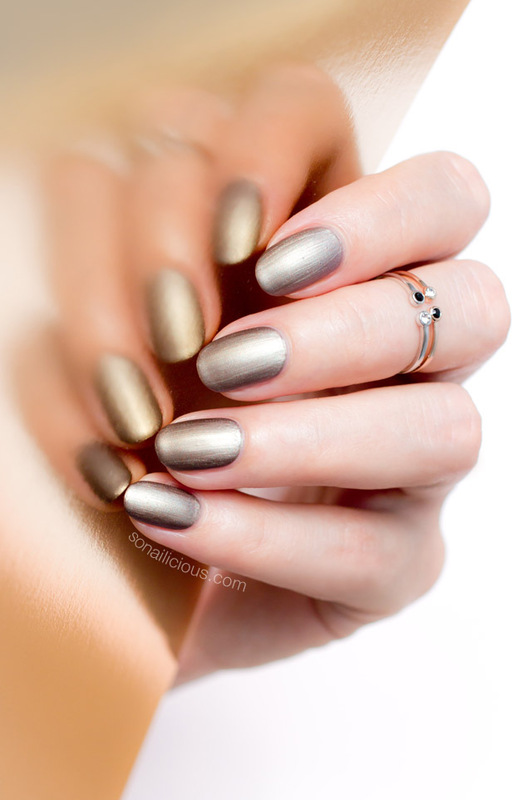 You’ll only need 2 coats to get Rose Fusion full opacity (2 coats pictured). 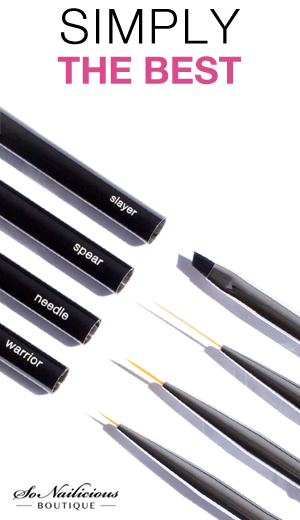 Application: The signature Chanel brush makes application flawless. However, the texture seemed a little thick and required some effort conceal the brush lines. 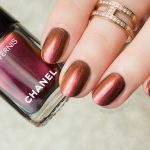 Also, make sure your nail surface is smooth and even because like any duochrome, Chanel Rose Fusion highlights and amplifies even the tiniest imperfection. Finish: Subtle purple taupe with a metallic multi-faceted shimmer and a slight duochrome chameleon effect. The colour ranges from bronze to rose-purple. Wearability: Lasted for 3 days so far without chipping. 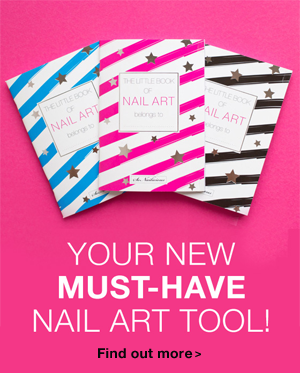 Nail Art: Great for nail art and quite beautiful on its own. Great mattified (the very last photo below). Overall Impression: Chanel 757 Rose Fusion has understated chic and yet is statement enough for a special occasion. It’s perfect if you don’t like glitter but still want something glam with a bit of daring for the biggest night of the year. 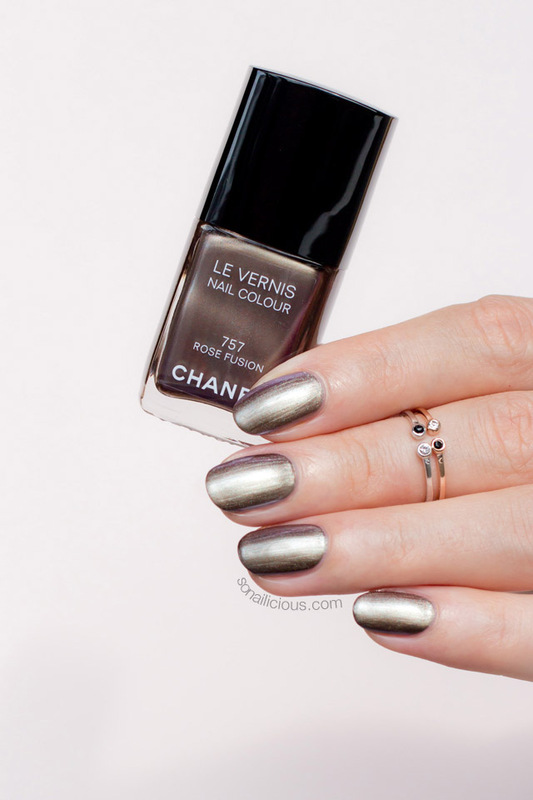 An absolute ‘must have’ for any Chanel polish collector. Availability: Chanel Rose Fusion, US $27 available here, here and here; AUS $39.00 – here. So, what do you think of this unusual colour and its unique properties? Will you get Chanel Rose Fusion? Already got it?